Published: July 10, 2013 at 09:32 a.m. Updated: July 10, 2013 at 04:17 p.m.
Joe Flacco and Aaron Rodgers set the table earlier this offseason for monster quarterback contract extensions. It's Matthew Stafford's turn now. 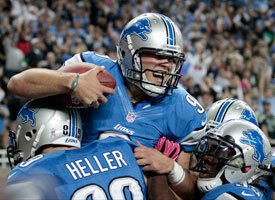 The Detroit Lions announced Wednesday morning they have signed Stafford to a contract extension through 2017. The quarterback said he's happy to have the deal completed and to create some salary-cap space for the Lions, Tim Twentyman of the team's official website reported. "I wanted to do what was right for the club," Stafford said. The Detroit Free Press and ESPN first reported that Stafford could sign a three-year contract extension with the Lions as early as Tuesday. NFL.com's Albert Breer, per two sources involved in the negotiations, reported Tuesday that the total value of the three-year extension for Stafford will be $53 million, putting his five-year haul at $76.5 million. Stafford will receive $41.5 million guaranteed and, according to ProFootballTalk.com, a $27.5 million signing bonus. The totals make sense. The extension pays Stafford nearly $18 million on average per season. That's roughly the same per-year average as Tony Romo. Not coincidentally, Stafford and Romo share the same agent. The news doesn't come as a huge surprise because Lions general manager Martin Mayhew openly has talked about wanting to give Stafford a new deal. Breer reported in February that contract talks had started. The Lions have gone a long time without a franchise quarterback and wanted to make sure they didn't let Stafford go. They also got a mild discount by signing Stafford with two years still left on his rookie contract. Check out the best photos of Matthew Stafford. So why do a deal now? Breer notes that previous renegotiations of Stafford's contract gave him a salary-cap number of $19.3 million. This new contract will help save the Lions money against the cap over the next two years. Still, the Lions partly are paying on potential. Stafford has proven to be a very good starter, but he still has a long way to go before becoming one of the NFL's best. His flaws showed up in 2012, and last year's rookie class demonstrated that youth doesn't have to equate with inconsistency. Stafford has the potential to be great. He's being paid to be great. His accuracy and decision-making are not great yet.